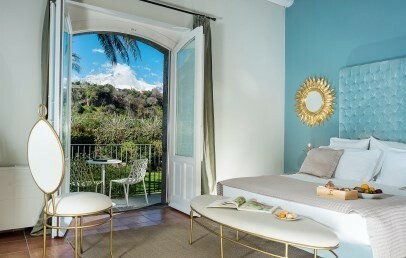 Placed between the Volcano Etna and the Ionian sea, the boutique hotel Donna Carmela is in Carruba di Riposto, the ideal position to reach many sites of cultural, naturalistic and touristic interest of the area. In the vicinity there are some of the most renowned beaches of the region but it will also be possible to easily reach the towns of Catania, Taormina, Siracusa, Acireale, Piazza Armerina and, of course, organize visits and trekking to Mount Etna. The distance from the sea is 3 km. The nearest airport is Catania-Fontanarossa at 45 km (30/40 minutes by car). Donna Carmela is a Sicilian residence of the 19th century, enchanted and charming place for a holiday dedicated to relaxation and the pleasures of the cuisine and the God Bacchus. In fact, Donna Carmela, besides being embedded in a luxuriant nursery of 550 hectares rich in Mediterranean and sub tropical plants it is also a winery located in the northern side of the volcano, at a few km from the hotel site. 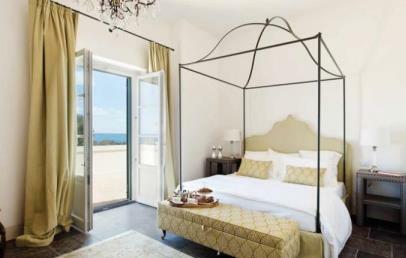 The style of this charm hotel, that has been carefully restored by a French interior designer, is the result of the perfect union between classic and modern design able to fulfill the needs and tastes of the most demanding guest. The sophisticated atmosphere of the environment together with the warm welcome and hospitality of the staff will make of your holiday a relaxing and peaceful experience. 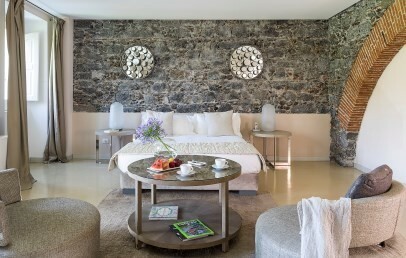 The property distinguishes itself for its courtyards in lava stone paving, the ancient cistern and river pebbles, the well-stocked wine cellar and the swimming pool surrounded by secular olive trees. 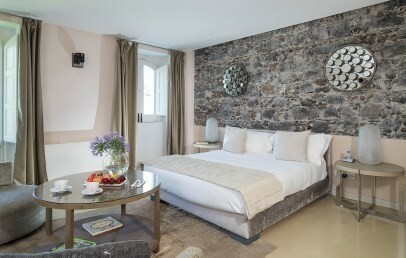 The Donna Carmela's accommodations are designed to cater to the various guests' tastes and for several moments of your stay. 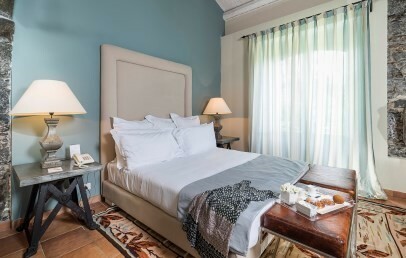 It offers 29 accommodations including Classic and Comfort rooms, Deluxe two-story rooms, Lodge and Romantic Lodge with outside whirlpool (heated), Dependence Villa Mediterranea with pool and Imperial Suite an exclusive Villa with private pool. The restaurant of the hotel with à la carte service is also open to the non-resident guests (with reservation) and it is the ideal place to experience the typical tastes of the Sicilian gastronomic tradition. The dishes are skillfully prepared with fresh home products and accompanied by selected international and local wines, including the homemade wines of Donna Carmela winery. An appreciable wine among these, is the excellent Pietradolce Etna Doc. Donna Carmela disposes of a large internal parking place, laundry, reading room, AC, pool and solarium. 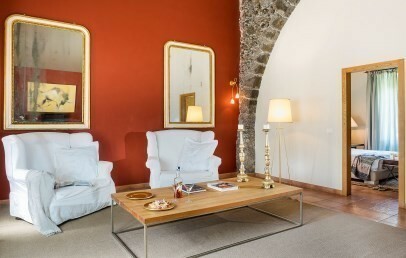 On request it is possible to organize wine tasting of the wines of the Etna area, visits of the winery, botanical visits, excursions to Mount Etna and to the most important cultural sites, motor yachting excursions, fishing, massages and beauty treatments. Classy double room with quality furniture and a modern style with a touch of vintage. The bathroom has a shower, hairdryer, bathrobes, courtesy set. 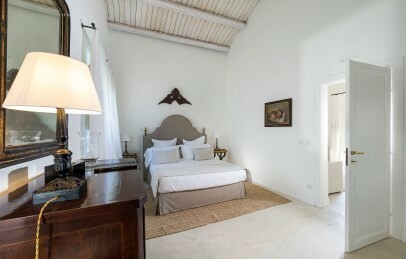 The rooms are located on the first floor and have a small balcony either on the Etna or sea side. 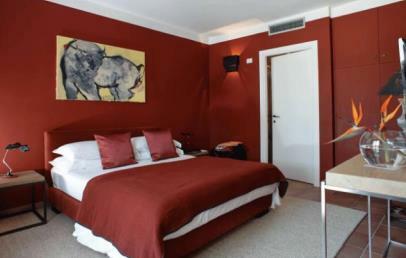 Classy double room with quality furniture and a modern style with a touch of vintage. 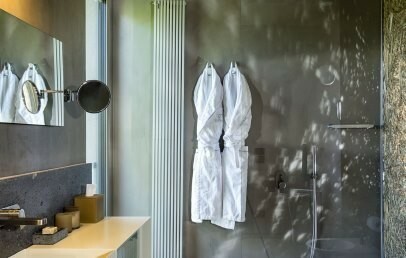 The bathroom has a shower, hairdryer, bathrobes, courtesy set. The rooms are located either on the ground floor or on the first floor; some have view on the sea side and some others have a balcony. This rooms are ideal for 2 adults + 1 child. Two of the rooms have access for disable people. Independent accommodations with privacy and a nice terrace of approx. 15 sq.m. 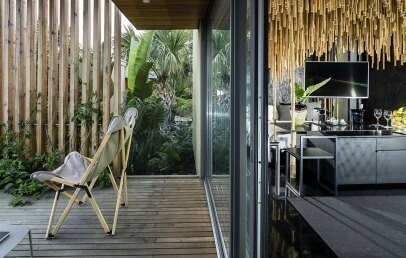 The Lodges are embedded in the nature and realized with an eco-friendly architecture in a modern style. 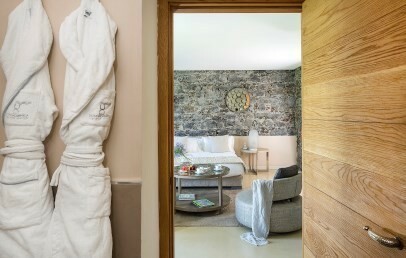 The bathroom has a shower, hairdryer, bathrobes, courtesy set. Some are surrounded by the garden and have no view, others have a sea-side view. 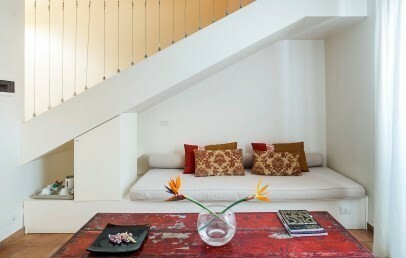 Classy accommodation with living room, decorated with modern art details and particular pieces of furniture. 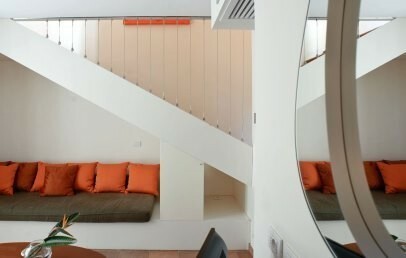 They are located on the ground floor, distributed over two levels, have 2 bathrooms and a balcony. The bathrooms have shower, hairdryer, bathrobes, courtesy set. Two of the rooms have view on the sea side. This rooms are ideal for 2 adults + 1 adult or child. 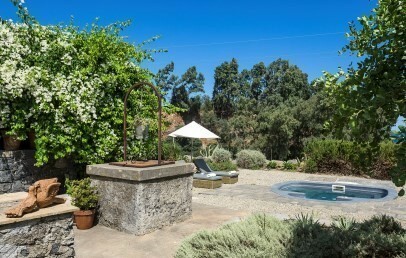 Independent accommodations with privacy and a nice terrace of approx. 15 sq.m. and a outdoor whirlpool filled with saline water and heated. 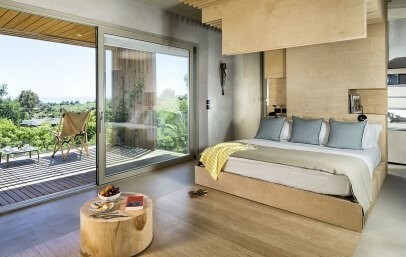 The Lodges are embedded in the nature and realized with an eco-friendly architecture in a modern style. The bathroom has a shower, hairdryer, bathrobes, courtesy set. They offer a view on the volcano Etna and towards the sea. One Lodge is furnished for disable people. The Depandence is a Villa embedded in the green. 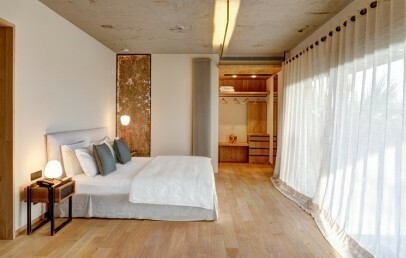 It has a master bedroom, a second bedroom with two single beds and a living room. 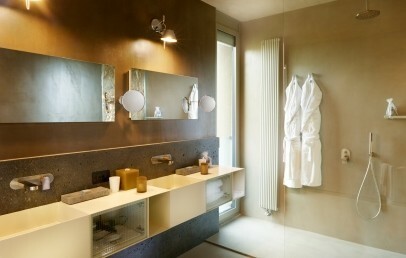 Every room has modern comfort and they are all furnished with particular care. The bathroom has shower, hairdryer, bathrobes, courtesy set. 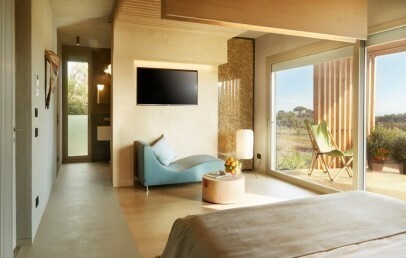 Moreover it offers relaxing outdoor areas with patio, whirlpool and a stunning view on the Mount Etna and over the sea. 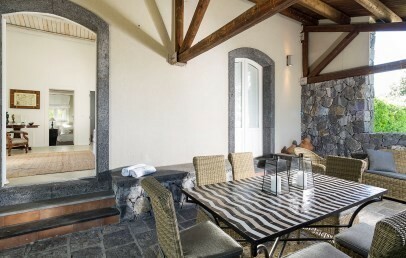 This Villa is ideal for 2 adults + 2 adults or children. Large and elegant accommodation spread over 2 floors with 5 double bedrooms with private bathroom (3 bedrooms with double beds and 2 rooms with the possibility to have separate beds). 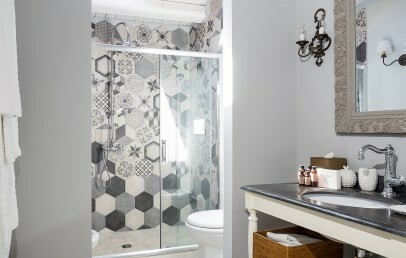 The bathrooms offer tub and shower, hairdryer. At the inside are a kitchen in common use, a dining room and a living area. 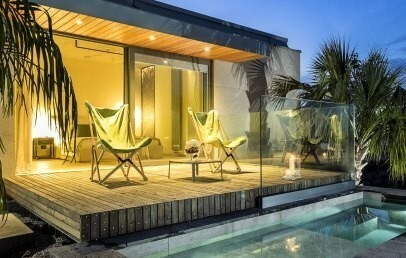 The outdoor space offers a private pool (heatable) with relax area equipped with sun loungers and umbrellas and view over the sea and Etna. Ideal for a stay with family or group of friends. 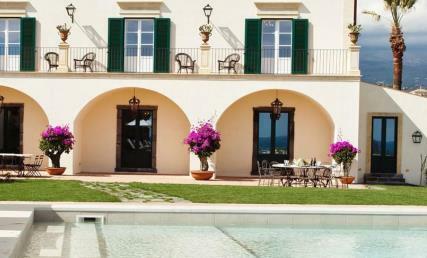 10% reduction for stays of minimum 3 nights in May + 1 bottle of wine or prosecco in the room!